We had a really nice time in Durango and at RV park on the river. But it is time to start moving on. Thank you for the feedback that these maps are helpful. We would love to hear more from you in the comments! 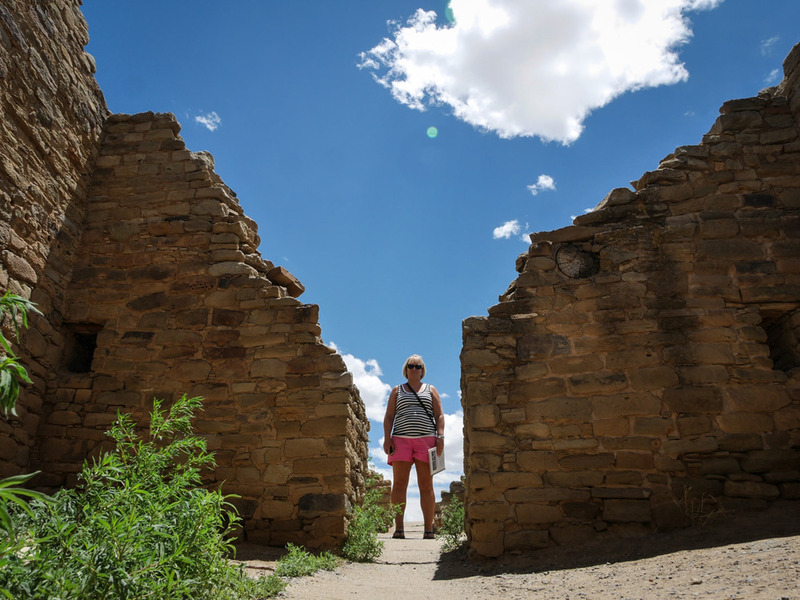 A short drive out of Durango we stopped in Aztec to view the Aztec Ruins National Monument. We learned the place was misnamed, Aztecs didn't live here, but the place is actually really old, with construction starting around 1100. We had seen ruins of kivas in other places, but here they have a beautiful kiva rebuilt in the 1920s. This is what it would have looked like back in the day. The rest of the monument is not deeply restored but has a really good self-guided interpretive tour that gave us a lot of info. The walk goes through a section of buildings featuring original 900 year-old wood ceilings. A local silver jeweler was selling wares are the monument and on the way out Jessie got herself some pretty silver and turquoise wrist decoration. After our visit to the Aztec Ruins we enjoyed lunch, gassed up and then drove on to Albuquerque where we'll just be staying for one night as we continue south.